A composer will spend tens of thousands of hours perfecting his trade. People who play keyboards like I do will spend a lot of this time in a chair. If you have more than one keyboard stacked vertically, your sitting height will not be a standard 20" from the ground. Adding books to a standard piano bench I measured my optimal seat height as 26" tall for my studio rig. Guess what? They only chair you can buy at any price with a 26″ seat height is a drafting chair. I sat on one in an office store to try it, the leg rest broke right off. Rickety as they are, drafting chairs are rated for “light use” only,1 to 3 hours daily. At 3 hours a day, learning for 20,000 hours would take 18 years. So one starts thinking where people use chairs for extended sitting sessions. Decommissioned airplanes! 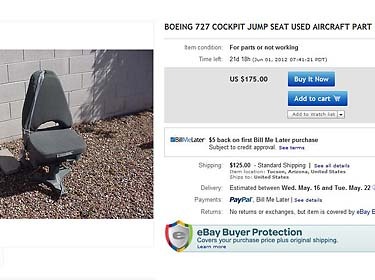 A quick check on eBay, and yup, someone is selling a Boeing 727 observer’s seat for just $175. Looks more like a WW2 military latrine cover, though. Tell studio visitors this came out of a Boeing, and they’ll just laugh. Time for Plan B: let’s head for the Elegant Leather Seat Forest. Also known as the city’s car junkyard. 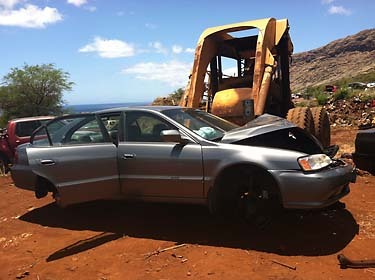 The junkyard operators found me a perfectly working leather seat in a new Acura TLS (see picture) the owner lovingly wrapped around a tree. One can’t say enough good things about bad driving. It makes the car last as long as you do, supplies YouTube with an endless stream of crash videos, and provides upcoming composers with genuine fake leather seats. I bought a worn office chair for its rotating / adjustable leg part for $15 at Salvation Army, but on the way home I found a much nicer silver one abandoned on the side of the road. (Long live parrot poop what got it tossed!) For the wooden plate to join the car chair top with the office chair legs, I picked up a 5-layer composite 14″x18″ board from Home Depot’s cull box, for a hefty price of $1. Adding Gorilla glue, black spray paint for the wood parts and four finger-thick metal nut/bolt combos, the total was roughly $105. My Plan A was to remove all car seat rail screws to make the two rails flat. Then I can attach a wooden plate to the rails, and the office chair leg to the plate. Look Ma, no welding! Nice plan, but a few twists to the round screw heads of the seat rail quickly convinced me, they won’t come off during this Presidential administration. Nor the next. 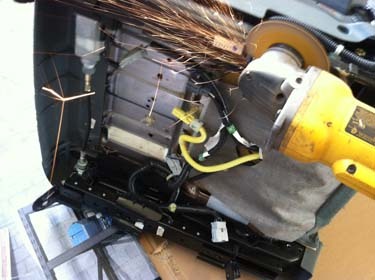 So instead I cut off the metal rail parts that extended down more than 1 inch with a power cutter (see picture). I spray painted the 1.5" tall wood bricks black, and as soon as the spray paint dried on them (and on yours truly), I Gorilla glued them to or near the chair rails’ ends with the chair resting upside down. Since this glue stinks to high heaven, I did all this at an open air location I had access to. Once the glue set, I put together the car chair, the plate and the office chair leg, trying to get a feel where to center things for the best balance. At the best setting I sprayed from underneath to get a black dot on the wooden plate where the leg part’s screw holes fall. I drilled the wooden plate at those locations and spray painted it black next. After the paint dried, I screwed the office chair leg with its orginial four bolts to the freshly drilled wooden plate, and I glued the whole to the wood bricks with the chair upside down again. Gorilla glue’s long time reliability seemed a tad doubtful. So the final step was to drill right through the wooden plate and bricks and the metal car seat rail and with four finger-thick bolts and cap each bolt with a nut. From a car chair I built a computer / keyboard chair that wouldn’t look too out of place in a Boeing indeed. (See final picture.) It cost less than what a fabric drafting chair would have cost in the store. 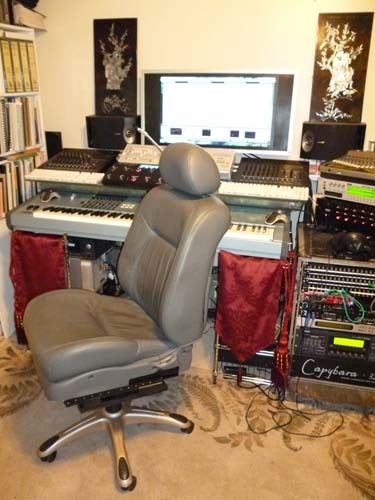 Besides, which drafting chair has a side air bag? And a seat belt socket I can pull out anytime I want to? From 26″ seat height it can go as high as 32″, it can tilt or lock, it turns around 360 and feels comfy like real leather. George Gershwin, here I come! If I can only sweet talk my better half to sit elsewhere from it.